Are you touring Shillong or the North East? Wondering what attraction is not to be missed in Shillong? Well, the answer is Ward's lake. In this article, I have jotted my experience and perspective of the Ward's lake. I am sure once you read this article you will feel like visiting this place if you haven't been there already. 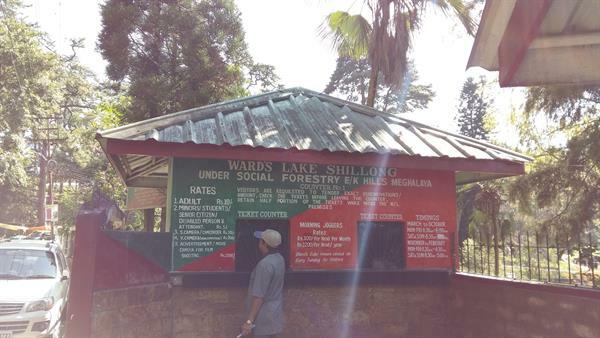 If you are in Shillong even for a day, you should not miss out on visiting the Ward's Lake. It is a horseshoe shaped lake right in the heart of the city and a very popular spot for all ages and can be visited at any time of the day. Be it for taking a lazy walk or to admire the green lawns dotted with multi-coloured flowers. 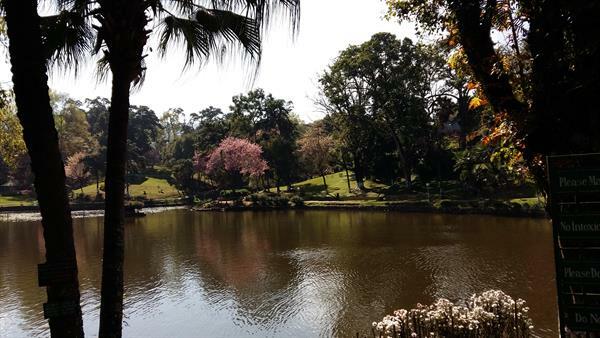 This place enchant you with the flowers and even the orchids and not to forget the bridge over the lake! Location: In Shillong, which is the East Khasi Hills District, of Meghalaya. The Lake is located just beneath the Raj Bhavan which is the Governor's Residence. Best time to visit: The Lake can be visited all the year round. The lake closing hours are adjusted with the sunset which happens quite early in winter. When we visited in Shillong in the second week of November the sky was pitch dark by 5 pm. But between March and October, the lake is open till 7:00 pm. Tickets: you can buy tickets at the entry for 10rupees. This is quite reasonable for the view you get inside. History: This artificial lake is about 100 years old and is called as Ward's lake. This name comes from Sir William Ward, the then Chief Commissioner of Assam, who initiated the plan for the construction of this lake. The lake was subsequently constructed by Colonel Hopkins in 1894. The area around this place was made by a Khasi prisoner who wanted a change in his monotonous daily routine. All those involved in building the Ward's lake and have ensured that this lake is nature at its very best and that each visitor will remember this place for life. About: Ward's Lake is a popular spot for both local and visiting tourists. It is an artificial lake surrounded by a large garden around a few hillocks with the lake in the center. Above the lake in the center is a wooden bridge you can see Lots of lotus plants with leaves and colourful fishes on either side of the lake. The bridge being in the midst of the lake is a perfect place to enjoy a view of the whole lake, and even feed the fish! I did a gradual circle and could get the view of the entire Ward's lake, and the green hillocks around the circumference of the lake. There are many cobbles stoned paths around the lake, some along the lake while others are between the beautiful flowerbed and amidst lush greens. Take your time, walk along these paths and enjoy the serene atmosphere of the lake and the surrounding greenery or sit back in the grass and enjoy reading your favourite book. Many local Khasis come in for a family picnic on holidays. During the evenings, you can enjoy the fountains and its scenic atmosphere. In one corner of the lake, you will definitely meet a few swans/ ducks some basking in the sun and others swimming in the water and enjoying themselves. Botanical garden: This is very much near the lake and has an extensive range of exotic plants and flowers including orchids which adorn the lake. It is worth a visit for nature lovers and students. Facilities: There are boating facilities in the lake and are very reasonably priced. There is also a cafeteria which provides a wide range of food and beverages for refreshment. What we did: We took or time and moved around the lake. Since the lake is not too large, and we have done boating very often, we did not experience a boat ride here. But the bridge, the cherry blossoms, ducks and cobblestoned pathways beckoned us. We went to the lake and enjoyed clicking selfies, photos, and panoramic views. So Ward's lake was captured not only in our hearts but also on digital media to be looked at in the coming years. I am sure our photos will give you an idea of the beauty of the lake. The gardens were very well maintained and there was no speck of plastic, paper or any other kind of waste. Since this place is in walking distance of Police Bazar, and if you end up staying there, you can visiting even twice in the day. The view at dusk will be mesmerizing. To sum up, the sloping walkways, beautiful flower beds amidst lush greens, cherry blossoms, botanical garden, fountains and the beautiful Lake, makes this place a must to visit! Wards Lake in Shillong is a perfect place to spend time with family. A good place to experience boating, especially pedal boating. Awesome coverage of Shillong and Meghalaya. Wards lake looks really scenic. I remember seeing a photo of some river or lake with the water so crystal clear that you can see the country boat suspended in the water and the river bed too. Is there wildlife sanctuaries in Meghalaya with wild felines and all?